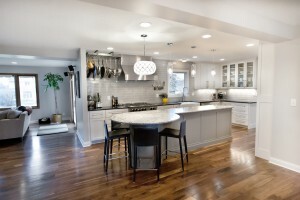 It is easy to get overwhelmed when diving into a kitchen remodel. Kitchen cabinets are no exception. That’s why we do our best to help break the custom cabinet process into easy steps that allow you to see your dream kitchen come to life. Choose your preferred wood type and finish. One of the first decisions you’ll need to make is deciding which type of wood you want to showcase in your remodeled kitchen. Do you want a dark, rich look? Then cherry or a dark oak may suit you best. Want something lighter? Maple or pine may be right for you. Then determine if you want to do even more by staining, painting or adding a glossy coat. Determine which door style you want on your remodeled kitchen cabinets. Did you know that a door isn’t just a door when it comes to custom cabinets? There are several different styles of doors available to you, ranging from inset to overly and flat to raised paneling. Do your research to see which door style you most prefer. Break up large sections of cabinets with creative design options. You can add a bit more eye-appeal to your custom cabinetry by adding a few creative touches, including glass-front doors or using creative displays with open sections of cabinets. Find the right knob, handle or pull to round off your custom cabinet design. Hardware matters when it comes to cabinets. And the options available today are endless. From knobs to hand pulls, stainless to nickel, the type and finish of your cabinet hardware really help to make your remodeled cabinets come to life. Are you not sure where to even start? Don’t worry! At Artisan Cabinets, we offer dedicated cabinet design services along with build outs. We can offer you the consultative and construction services you require when you want to remodel your kitchen cabinets. Call us at 952-737-7088 or leave a comment below to learn more!